Thank you for your interest in Blue Boar Restaurant! Located at the centre of Conrad London St James, Blue Boar Restaurant lends itself as an exceptional drinking and dining destination for business as well as pleasure. 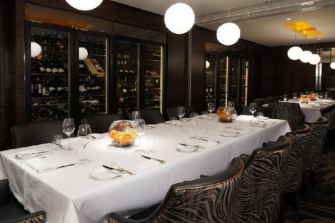 Our exclusive private dining rooms are concealed behind a floor-to-ceiling wine wall and are perfect for business meetings, celebrations and special events. Each room comfortably holds 10 guests, but if you have a larger party, we can seamlessly join the two to provide private dinners for up to 20 people. Available for private breakfasts, lunches and dinners.